Chief Darin E. Cook and the Spencerville Police Department would like to welcome you to our website. We hope that this page is a convenient way for the citizens of Spencerville to contact us or seek answers to questions and concerns that you may have. This Police Department is a caring and sensitive organization dedicated to the concepts of personal excellence, teamwork, and focused performance. We believe in the dignity of all people, and we desire to protect individual rights. We aspire to contribute to quality of life for all of the people by providing understanding and compassionate Law Enforcement Services. The Police department is a 24/7 service to assist you with any complaint that you may have. We also provide other services that you may not be aware of. Below are some of the services that we do to assist you and the community. All of these services are frees to better assist you and your family. 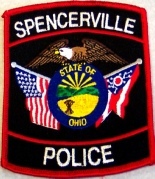 If you accidentally lock your keys in your vehicle, the Spencerville Police department will unlock it for you. If you and your family will be leaving for vacation, the Spencerville Police Department will make sure that your home is safe and secure while you are away. If you are a new business, the Police Department will check your business to ensure the security of your business,. For more information, call or stop by the Police Department. We will insure that our golf cart is ready for the road. The Police Department will inspect your golf cart to insure that it is compliant with the State Laws. The Spencerville Police Department would like to take this time to remind the community about the parking concerns we have received. We ask that you obey the law and posted signs that are placed for your convenience. While parking your vehicle, remember your vehicle must face the same direction of travel. While exiting the ally behind Shell gas Station, we would like to remind the community that you need to exit the alley to the right. We are also aware that at times your view can be obstructed to the left and we are working to resolve that issue for your safety. If you have any questions or concerns, please contact us by phone or email an Officer located I the “Contact Us” section on this page.